In 1978 Joseph Freeman became the first man of African ancestry to be granted the priesthood after the Church of Jesus Christ of Latter-day Saints announced that any male could be ordained, regardless of race or color. Freeman was born July 24, 1953, in Vanceboro, North Carolina, to Rose Lee Smith and Joseph Freeman Sr. His great grandparents were slaves prior to the Civil War but escaped and eventually become tobacco farmers in North Carolina. They passed down the family business to Joseph’s father who by the 1960s was farming in tobacco, cabbage, and other crops. Joseph worked with his father and brothers as loggers in the winter as well. Freeman was raised in a Christian family. His mother was a minister for the Holiness congregation, and Joseph had a lifelong dream to become a minister like his mother. He was baptized into the Holiness Congregation at age ten. The family moved to Greensboro, North Carolina, during his teenage years and after graduation from high school, Freeman was ordained a Holiness minister. He turned down a scholarship to attend a Methodist seminary because he believed it was more important to be a lay clergyman that to be paid to preach. A year after graduating from high school, Freeman joined the Army at the age of nineteen and was stationed in Hawaii from 1972 to 1975. While there, he visited the Polynesian Cultural Center and met missionaries from the LDS Church. He eventually became converted to the LDS faith, joining on September 30, 1973, in spite of his knowledge that the church did not allow black men to be ordained to the priesthood. He married his wife, Toe Isapella Leituala (pronounced To-a), a woman from Samoa, who was instrumental in his conversion. Toe had served a mission from 1970 to 1972 in Samoa and attended the Church College in Hawaii while working at the Polynesian Cultural Center. Joseph was impressed with her religious upbringing; she also came from a very religious family and was also a convert to the LDS Church. They were married on June 15, 1974. Their first child, Alexander, was born in March 1975. Freeman and his wife spent some time visiting her family in Samoa, as well as his family in North Carolina before moving to Utah where their second child, Zecheriah, was born in Salt Lake City in 1976. In 1977 Joseph was called to serve as a leader in the Genesis Group, a group established in 1971 to provide outreach to black LDS members in the Salt Lake Valley. On June 9, 1978, all priesthood restrictions were lifted on black LDS men, and temple restrictions were removed for both men and women. Two days after the announcement, Joseph was ordained the first black elder in more than a hundred years. After his ordination, Freeman was highly sought after by national media outlets, including ABC’s Good Morning America, People magazine, Ebony, and Time magazine. 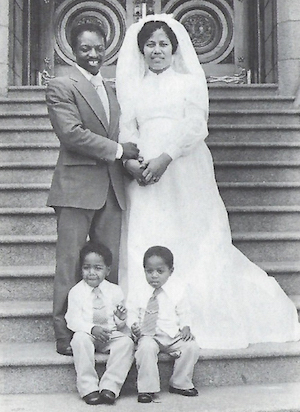 Two weeks after his ordination, Joseph was sealed to his wife and children in the Salt Lake Temple on June 23, 1978. Since that time, Joseph Freeman has gone on to serve in other LDS leadership positions, including bishopric and temple worker. Joseph Freeman, In the Lord's Due Time (Salt Lake City: Bookcraft, 1979); “Mormonism Enters a New Era,” Time magazine, August 7, 1978; Jean Torkelson, “Black man a pioneer in Mormon priesthood: Joseph Freeman has served LDS Church for 20 Years,” Rocky Mountain News (Denver), May 29, 1998.